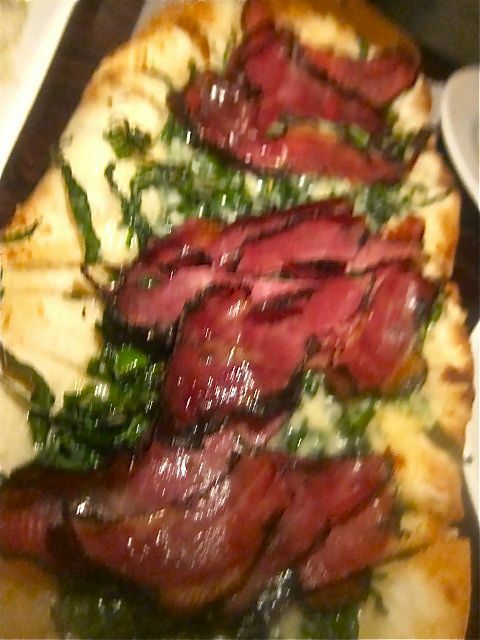 It takes chutzpah to mix pastrami, heavy cream and kale on a flatbread. Forgive my blur. The West Side Rag’s new restaurant roundup alerted me to Bustan on Amsterdam, not far from my homestead. “Sounds Lebanese,” I said, confusing it with Al Bustan across town. 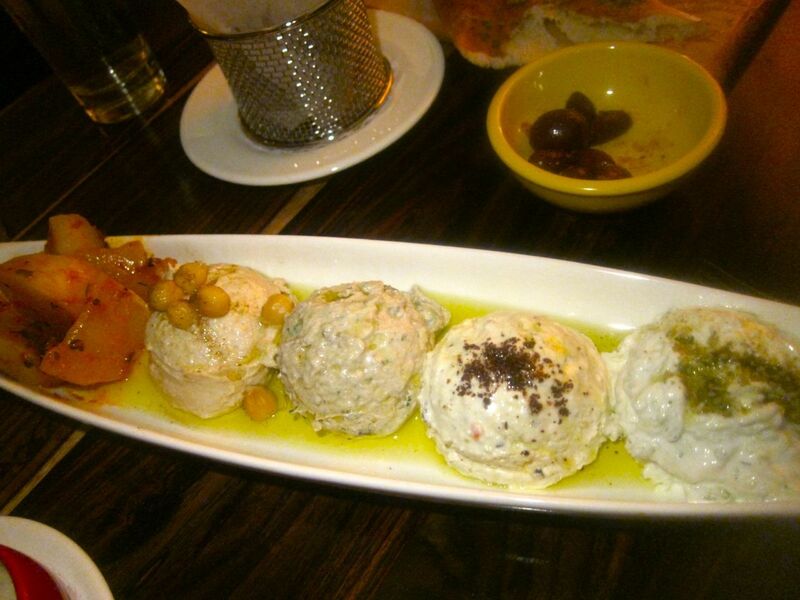 “Sounds like mezze,” I told my friends on West 86th Street. “You can walk,” I tempted them. The enthusiastic design includes everything and the bathroom zebras. I like this fixture. That first Saturday night, the place was bustling. The hostess seated us at a round booth striped in many colors. “To keep you out of the draft,” she said. It was an icy night and they had no windbreak. I rolled my coat up beside me. Minor annoyance: no coat check either. Dorothy, always a good sport, sat on her mink. From the mazettim list, I order (left): pickled beets, hummus, eggplant, tzatziki, spicy feta. The usual display of discipline (no, not from me, needless to say, but from my pals) vanished with the landing of olives and the house’s fabulous, blowsy flat bread like a stretched-out pita, warm and oozing from the oven, for scooping up the spreads. “Mazettim,” the menu calls them -- one for $5, three for $13, five for $19. I chose the quintet: hummus, tzatziki, spicy feta, smoked eggplant and Moroccan turnips, pickled pink. I could live without the turnips but I’m polishing off the last of everything else. There a medium soft boiled egg inside the crispy filo served with creamed sunchokes and mushrooms. Why isn’t the menu more Lebanese? I’m wondering. I don’t need to come here for salmon roulade when I can have a “Soft Egg Bourrick.” That could be Tunisian or Algerian I’m thinking. If I were more of a linguist, I might have picked up the Israeli vibe. Mazettim, it seems, is Israeli. Google didn’t seem to know that. Perhaps the other odd spellings are Israeli too. But the bartender said she was from Ukraine. Her boss seemed to be speaking Russian. Intrigued by the accent of our waitress, I asked. She’s Romanian. Isn’t that more Black Sea than Mediterranean? She seems fresh-minted, eager, interrupting our conversation again and again to see how we like each dish she delivers. What do you expect? It’s a smoked salmon pastrami flatbread with zucchini, kale and ricotta. When the falafel basket showed up next with pickled mango tahini alongside smoked salmon pastrami flatbread, we were already feeling overwhelmed in every way -- visually, the small table, the compelling flavors. The feeling of already having eaten too much. “Did we order this?” my friend asked. It was quite an eclectic combo: smoked salmon pastrami with zucchini, kale, ricotta and Parmesan. Global and noble, complete with veggies your mother would have wanted you to eat. It was oddly delicious too. 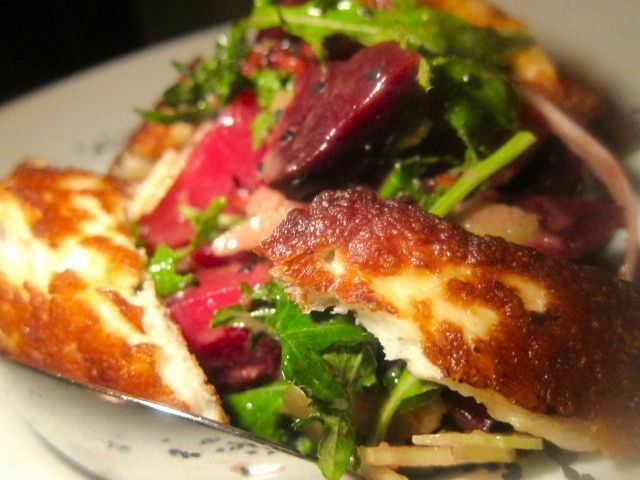 Opening week, the beet salad came fenced with grilled halloumi cheese rectangles. Then came a gorgeous beet salad with kale, pomegranate, shaved fennel, celery and pine nuts hidden under rectangles of grilled halloumi cheese. It could have been dinner all by itself, except that three of us were sharing it. Only the charred octopus with its warm white bean hummus and big hunks of crushed tomato disappointed. I’d never tasted such an unpleasantly soft octopus. That might have been opening week jitters. 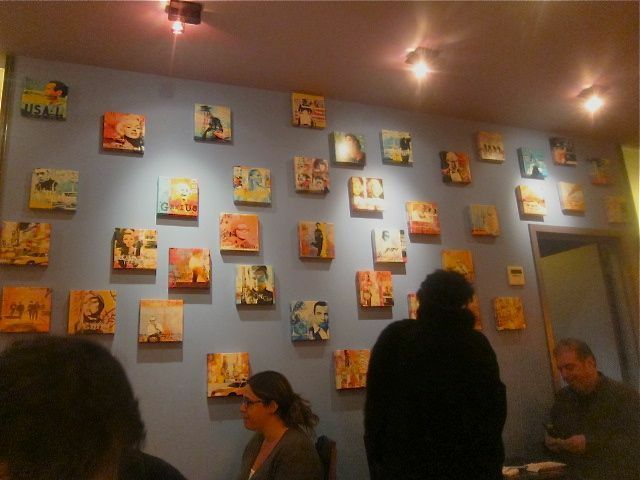 Idols and icons on the opposite wall, Marilyn, Elvis, Mick, Marlon, Charlie Chaplin. A month later, from a table closer to the kitchen, I can see there’s a different decorative motif every few feet. From the black and white pony skin swivel seats at the bar, you move to illuminated circles in the charcoal grey, faux stone wall -- too big to be portholes, possibly trying to look like onyx. There are swinging zebras near the bathrooms, robot clocks on the shelf, and opposite us now, a wall of icons in small sketches: Elvis and Mick, Chaplin, Brando, Marilyn twice and James Gandolfini. At what must be the power table, I notice Ruth Messinger with four women leaning in. It could be a political plot or just some hot gossip. 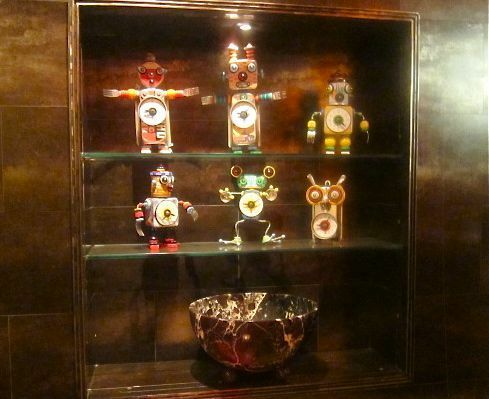 Every few feet there’s a new design motif, like this platoon of robot clocks on a shelf. The waiter tonight is freshly hatched too -- rushing, running, patiently explaining. The accent? Yugoslav. Is everyone Slavic? I ask. No, there is an Algerian and an Israeli and a Brit. “We have everything,” he says proudly, delivering a trio of mazettim -- three very large portions -- and that sprawling house pita fresh from the taboon for my companions to cut with a knife after I’ve torn off the end. On second visit, the three spreads came in such large bowls, we took the leftovers home. 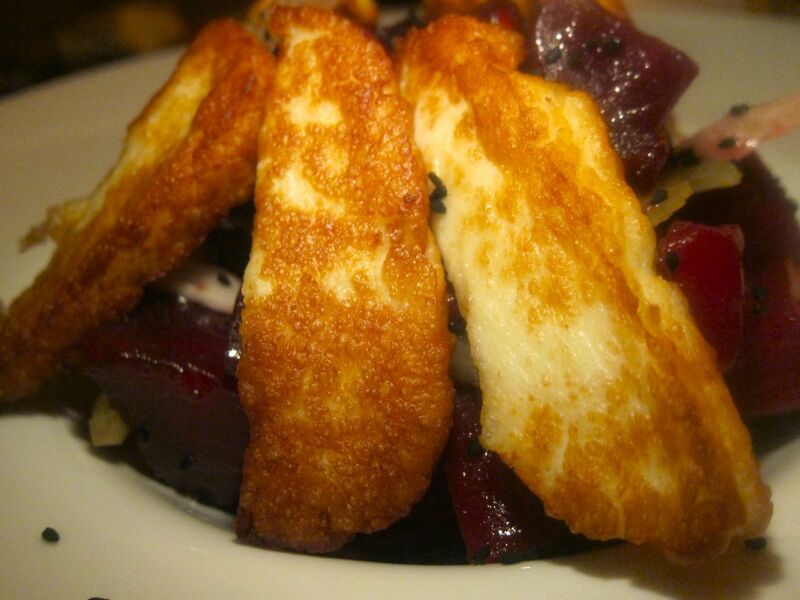 Except for the taboon-roasted beet salad -- with the grilled haloumi cheese tossed on in more manageable chunks -- I steer the ordering to taste different dishes. The virtue of kale tries to balance the heavy cream and Parmesan in a pastrami carbonara flatbread -- I smash the egg on top so we all get some. “Lamb Shawarma” on Japanese sticky buns looks like David Chang’s pork belly sliders. What the waiter spells as “Maroccan Sigars(sic)” on the bill, listed as “Crispy Feuille de Bric” on the menu, are crunchy veal-stuffed spring rolls -- meticulously fried, served with a duo of dips. 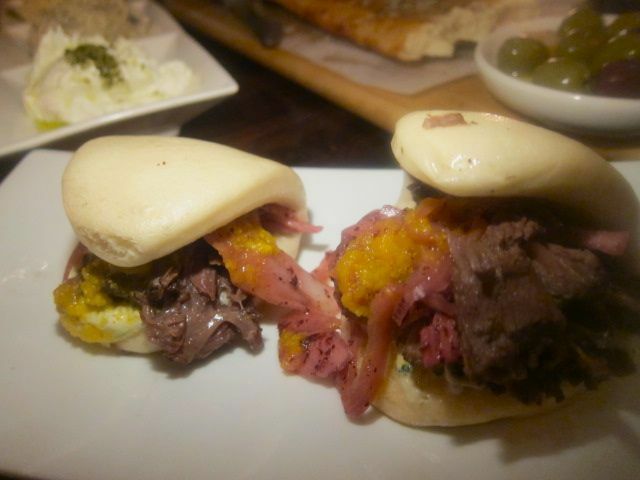 If David Chang were Israeli he might do lamb buns too. 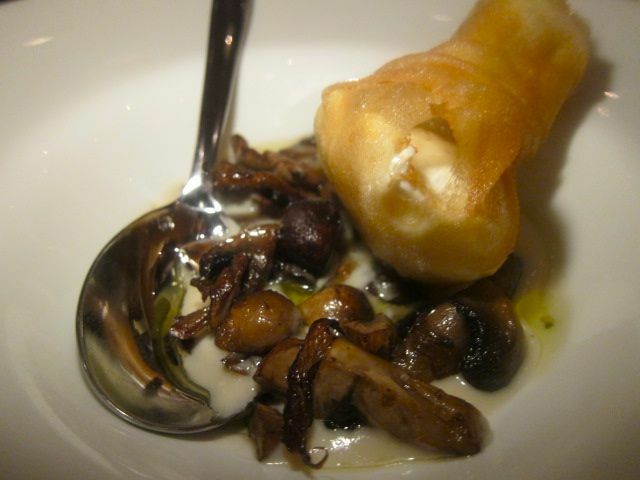 My friends don’t like the soft egg bourrick(sic) wrapped in crisp filo with creamed sunchokes, mushroom and truffle oil. I taste it twice to see why I rather do like it. 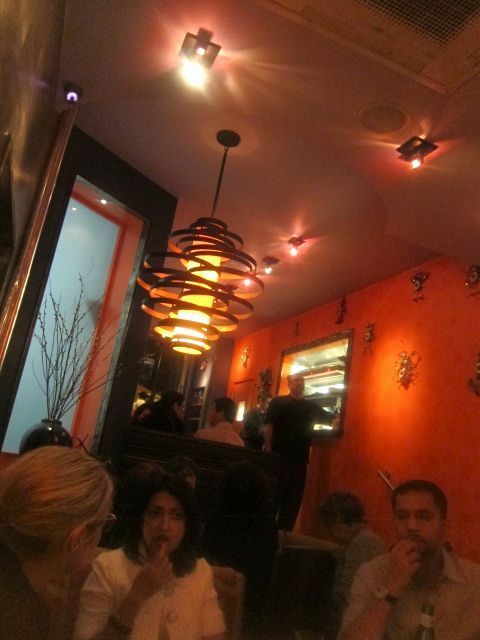 At the next table, a waiter delivers lamb kebabs in terracotta baked with a dome of bread. We plan to order it, but after the beet salad, there just isn’t room. Once again, my passion for dough has compromised my critical faculties. 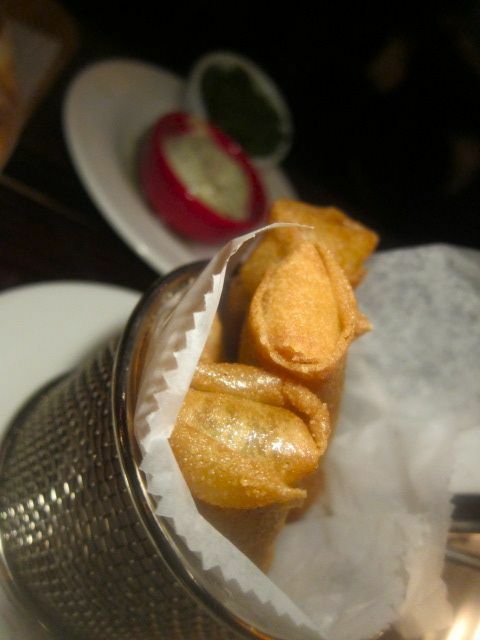 Almost anything could be stuffed into these crisp little filo rolls to dip in harissa. We’d be happy. There are so many oddities on the menu I’ve not tasted. Tuna crudo with salted granola and yogurt. Beef tartare in a pretzel crust. Saganaki with tomato compote. I had planned to go to a movie Saturday night. Instead, I’m back with another friend. The menu sets her hunger reeling too. I try to explain why it would be prudent not to order a flatbread. The beet salad with kale, pomegranate, shaved fennel and grilled halloumi has been restyled. Better by far is the whole heirloom cauliflower three ways, crunchy from the taboon. And the two of us are so excited to discover frikeeh magrada (smoked green wheat), a tasty $5.95 side we can not quite finish, that we forgive the unfortunate “Lump Crab Burekas.” I was expecting crispy roulades of crab. 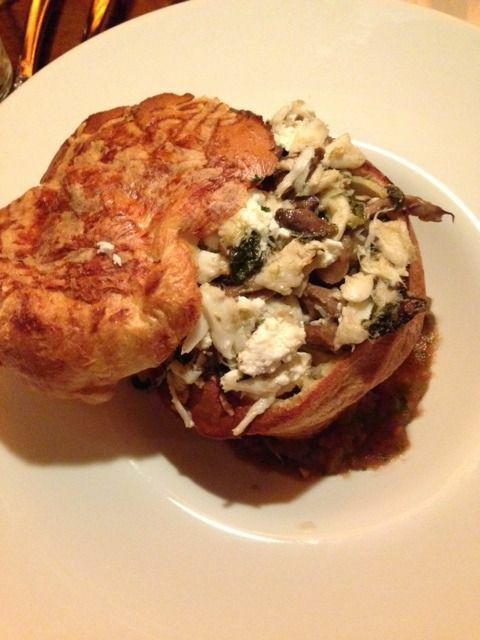 Instead more bread arrives: a hollowed-out popover, cute enough, but it’s impossible to taste crab overwhelmed by feta, mushrooms and creamed spinach. Take the crab out of the dish, perhaps, and it would stand alone. 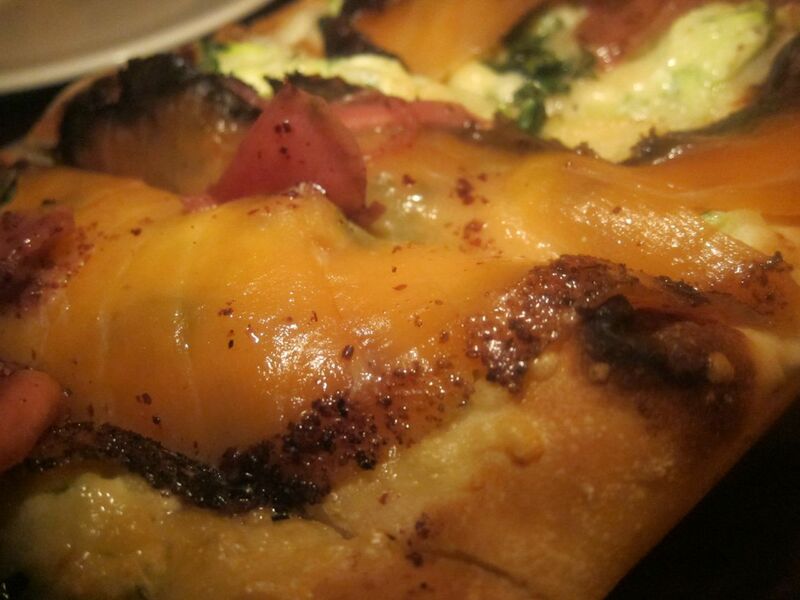 Delicate crab gets lost in this assertive mix of feta, mushrooms and creamed spinach in a popover. In three visits, I’d not yet ordered an entrée. Our neighbor at the next table assured us that her whole baked branzino was excellent. I doubt that will tempt me on my next visit when I’ll be exploring the ground lamb flat bread with sumac or the cured tuna pie with za’atar and feta before filling up yet again on an array of mazettim with the house bread. I’m not wild about this flourless chocolate fondant with Turkish coffee gelato and cornflakes crunch. Dessert has seemed redundant here. 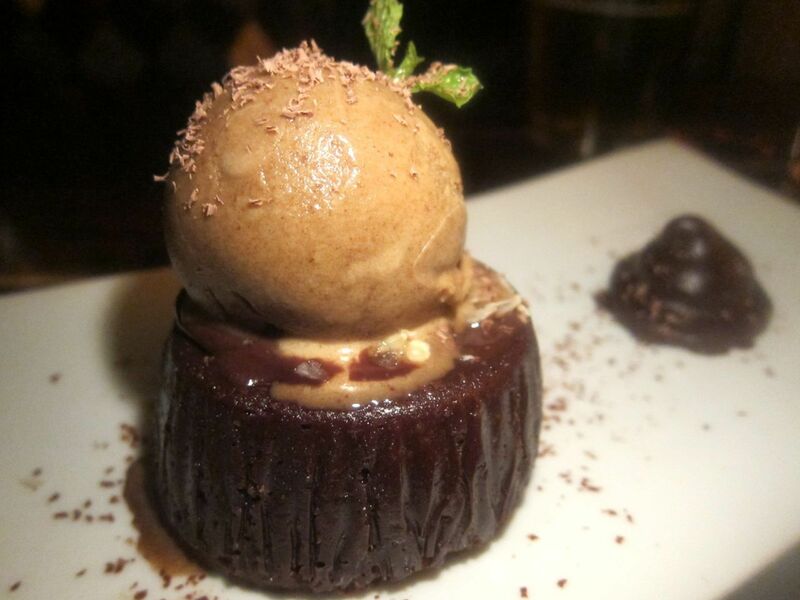 Neither the flourless chocolate fondant topped with Turkish coffee gelato and sprinkled with cornflake crunch, nor the shredded halva Silan with Rice Krispies brittle had appealed to me. I’m not much of a donut fan (call them beignets, bombolini or churros) so I’m surprised that tonight I’m falling for Bustan’s Moroccan donuts, chewy and sweet, with a trio of sauces: chocolate, raspberry or caramel. It’s after 9 pm, and the crowd clustered at the door reminds me of a Saturday night rave at Red Farm a few blocks south. The Israeli chef, Efi Nahon, formerly of Taboon and Barbounia, big and burly, looking not at all weary, emerges from the narrow kitchen to survey the crowd. 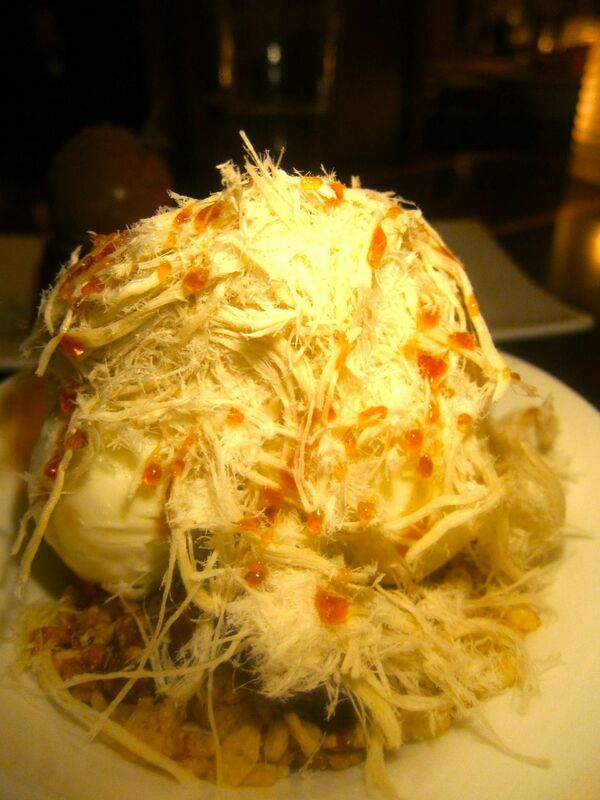 Shredded halva with Rice Krispies brittle doesn’t tempt me but I will succumb to Moroccan doughnuts. Bustan means garden in Hebrew and ancient Arabic. Partner Guy Goldstein, also Israeli -- “I’d follow Efi anywhere,” he says -- offers to show me the garden -- 34 seats, partly tented. “It’s all set up, ready to go on the first night warm enough,” he says. I had thought I would write that Bustan was good for the neighborhood. But even crowded as it is already, staffed by its good-natured but sometimes erratic crew, the truth is it’s definitely worth a detour. I feel obliged to write that even if it means I’m sharing a spot I love that I soon won’t be able to get into. 487 Amsterdam Avenue between 83rd ad 84th Street. 212 595 5050. Dinner, Monday through Wednesday 5 to 11 pm. Thursday till midnight. Sunday till 10 pm. Photos may not be used without permission of Gael Greene. Copyright 2014. All rights reserved. Click here to return to BITE listings. Click here to follow my twitterings. Click here to see my vintage evening bag collection on Etsy.